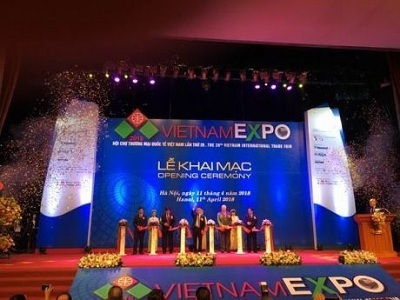 With the theme "VIETNAM EXPO - Strengthening regional economic connectivity and international", VIETNAM EXPO 2018 was officially opened at the International Exhibition Center in Hanoi (ICE) on the morning of 11/4. International Trade Fair 28 th Vietnam chaired by MOIT. this year, the fair continued to show a trade promotion event with the largest scale and significance of the sector industry and Trade, reflecting the spirit of "cooperation and links "are the mainstream of global economic trends. Products on display at the fair focused on sectors such groups: Machinery and equipment; Building and construction materials; Electrical, electronic and information technology; Materials; Food and beverage, agricultural products; Appliances; Health care products and services. For years VIETNAM EXPO did well as promoting trade between countries of friendship in the region and relentless ambition extended to power through the organization of annual increase in the number of enterprises, presence of strong brands, where the demonstration of new technologies, the activities connected, consulting, seminars meaningful. Speaking at the opening ceremony Deputy Minister of Industry and Trade Tran Quoc Khanh said, with the message: "Enhancing connectivity regional economy and international" we hope VIETNAM EXPO 2018 has become one of the activities promotion of trade with the largest scale and the significance for the sector of Industry and trade of Vietnam, bringing much economic value as well as provide opportunities practical help Vietnam enterprises increase exports, development growing domestic market, contributing to the Government's commitment to international economic integration. The fair will take place from October 11 to April 14 at the International Exhibition Center in Hanoi (ICE), 91 Tran Hung Dao Street, Hoan Kiem District, Hanoi.